Can I create a playlist of music or video clips? You can create a playlist using the PC desktop version of RealPlayer with RealTimes. Each playlist can contain a combination of music, photos, or video clips. These playlists are not uploaded to the Cloud and cannot be accessed on other devices, only your PC. 2. In the bottom right corner, just above the volume slider, click Queue. A panel will open on the right side of the player. 3. Click the Library tab and navigate to the Music or Videos section of your Library. 4. 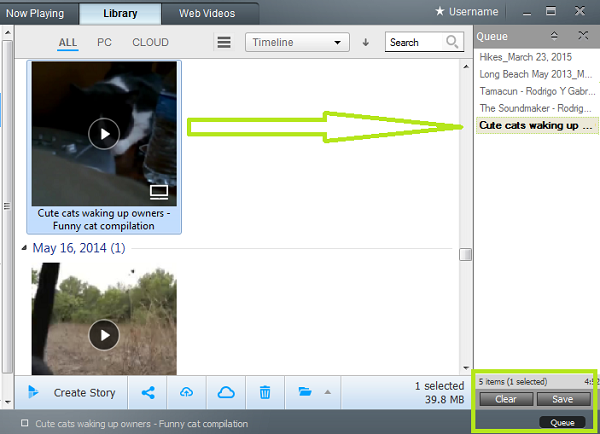 Click and drag the desired clips onto the Queue pane. You may rearrange them into any order you like. 5. When you have all the clips in the desired order, click Save. 6. Enter a name for your playlist and click OK.
To play the playlist, click Playlists in the left pane, select the list you want, and click the Play button on the Player Control bar. The clips play in order, from top to bottom. Make sure you click into the Now Playing tab to be able to view any videos in the playlist.